Fortunately I can eat them if they have been boiled, roasted or baked! Because I could not walk into the kitchen smelling of roasted Hazelnut and not try it! Allergy or not. This cake is so quick and fast to prepare. I often make it on a Friday evening for our weekend coffee and cake or as an easy transportable treat to bring round to my friends. Bake at 180 degrees for about 45-60 minutes. I would poke the cake after 45 minutes with a cocktail stick or fork to check if it's done to the desired consistency. Let the cake cool down. In the meantime heat the chocolate glaze and then spread evenly on the cooled cake. 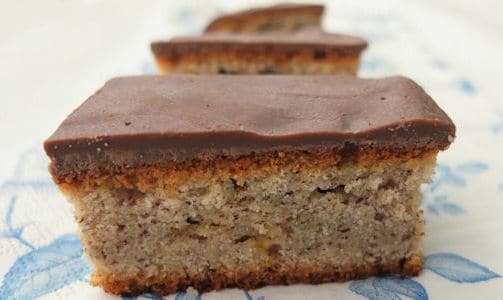 4 Responses to "The 15 minute German Hazelnut Cake"
Great I will try it on the week end when my filipino colleagues comes over to cook for me! So I baked it this morning. It is delious. I did not apply the choclate glaze and it still tastes just right. Note that you need to adjust the instructions… flour, salt… when to add?